Nowadays, there are basically lots of solid state drives for you to choice from, each varying from speed, price, capacity and the controller used. It’s good that faster SSDs are being produced at certain points. But the fastest SSDs on the market usually come with a much higher price tag. So how about an SSD that offers performance and at the same time comes with great value? Today, let’s take a look at ADATA’s latest SSD which was released a few months ago – the ADATA Premier Pro SP920. The particular model that I am going to review is the 256GB capacity with model number ASP920SS3-256GM-C. 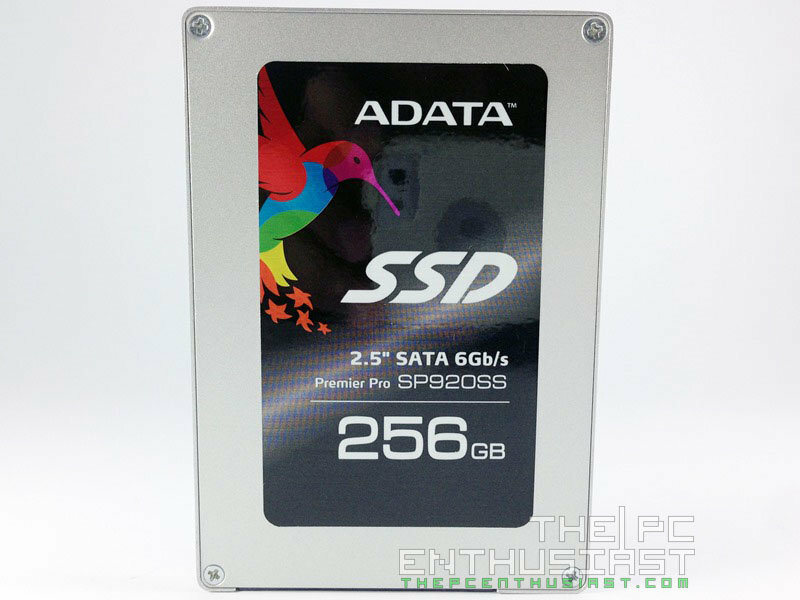 Please continue reading my ADATA SP920 review below and find out if this is the kind of SSD that you are looking for. The ADATA Premier Pro SP920 is a mainstream SSD that according to the company is designed to meet the high-performance requirements of multimedia file transfers. It features hardware-based AES-256 encryption engine; supports NCQ, Windows TRIM Command, and S.M.A.R.T. However the core of the SP920 is not actually a new product fully manufactured by ADATA. 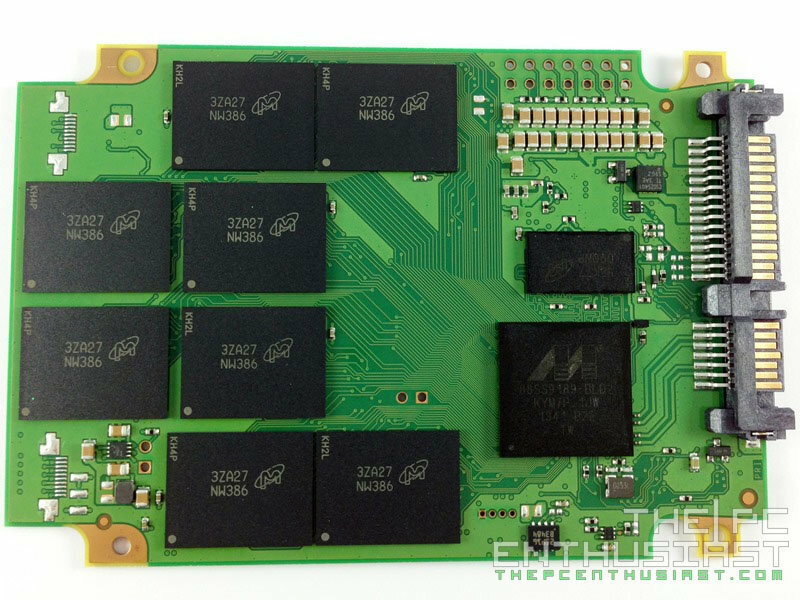 The SP920 uses Micron 128Gbit 20nm MLC chip that is being controlled by a Marvell 88SS9189 controller, which is surprisingly similar to Crucial’s M550 SSD. I did a little research and found out further that the internals of the SP920 and the M550 are actually quite similar. The only difference is that Crucial uses a 64Gbit 20nm MLC on their lower capacities, while ADATA uses a 128Gbit MLC chips across the board. Another obvious difference is their enclosure. So basically it is safe to assume that the ADATA SP920 series is a rebranded M550. Well, is that a good thing or a bad thing? Some people look at “rebrands” as a bad thing, but it’s actually not. Rebrands basically adds more value and drives competition specially in the mainstream market. The OEM of a particular product might offer a specific set of features for their particular product, but another company who rebranded their product might add more features or sell them at a lower price point. 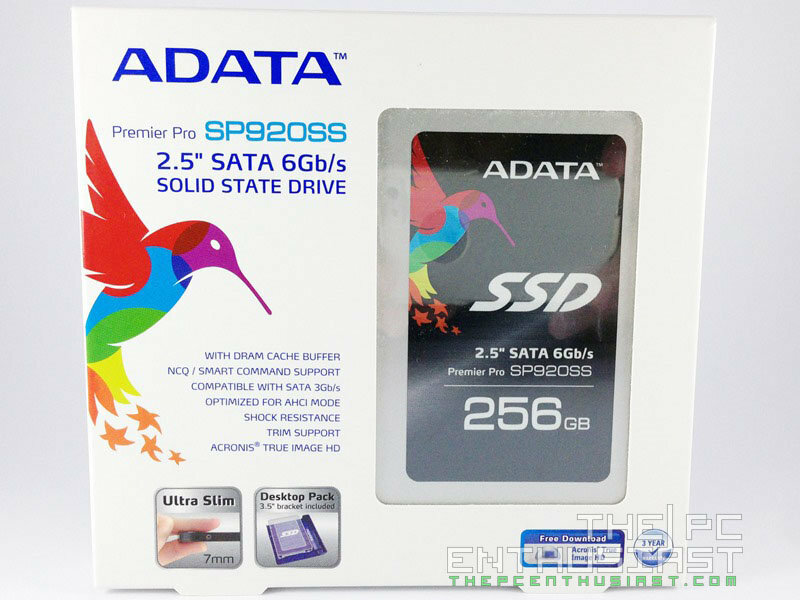 Another thing that I would like to point out is that if you visit ADATA’s page, they claim that “Premier Pro SP920 solid state drive has sequential read and write speeds of up to 560/500 MB/sec, great for video editing and fast data backups. 4KB random read/write speeds of up to 98,000/88,000 IOPS mean faster system starts, program loads, and great action in the most demanding next-generation games.” Well, this is basically true for the 512GB and 1TB model, but it’s definitely not true for the 128GB and 256GB model. I think ADATA should properly disclose that their product comes with varying speeds depending on the capacity. The SP920 128GB capacity comes with a rated read/write speed of 560MBps/180MBps; 256GB with 560MBps/360MBps; and the 512GB and 1TB with 560MBps/500MBps. As you can see the 128GB and 256GB capacity suffers from a slower write speed (specially the 128GB capacity). This is because ADATA used the same 128Gbit 20nm MLC NAND across the board, instead of using a 64Gbit NAND flash like Crucial did with their lower capacity M550. Does this make the SP920 a bad product? Should we avoid it? Don’t conclude first because we’ll take a closer look further and test this SSD below. The ADATA Premier Pro SP920 comes in a nice white packaging. 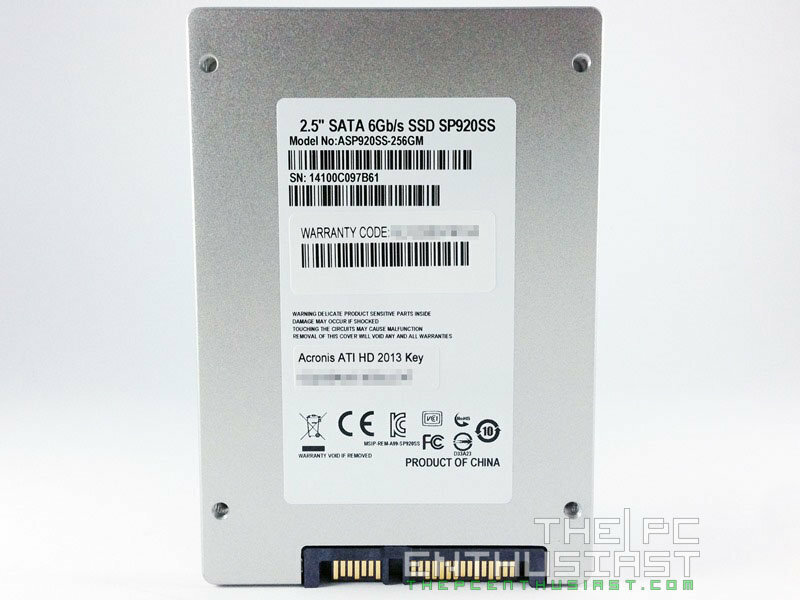 Please note that the box and the sticker label on the SSD says “SP920SS”. This is just a model number used in the 128GB and 256GB capacity. At the back of the box, you’ll see a brief description of the product together with its rated read/write speed and a QR code for a free software. Inside the box you get a quick start guide, a 2.5mm holder for use with 9.5mm bays, a 3.5-inch conversion bracket for desktop use, and some mounting screws. Aside from the 2.5mm holder, ADATA is giving a 3.5-inch bracket and a free migration software that Crucial doesn’t have with its M550. Above is the front and rear view of the ADATA SP920 256GB (ASP920SS3-256GM-C). 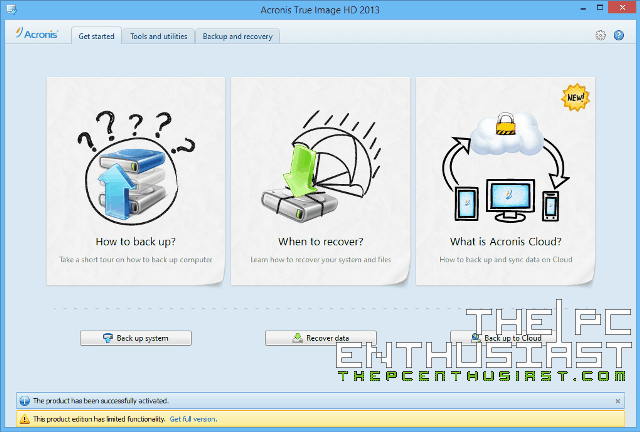 The Acronis True Image HD 2013 key is located at the back below the warranty code. You will need this unique code in case you decide to use the free migration utility. Here we have a closer look at the PCB and the Micron 128Gbit 20nm MLC NAND chips of the ADATA SP920. 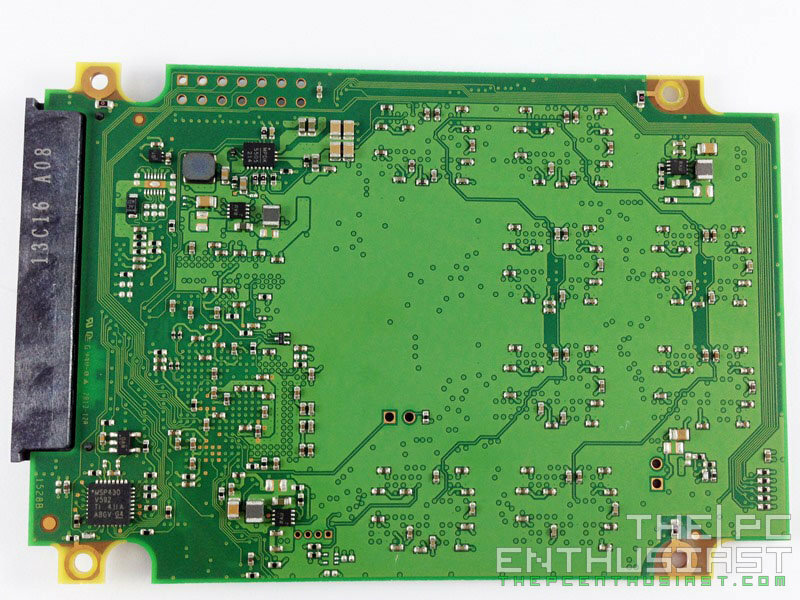 If you have seen the PCB of the M550, you’ll notice that it has a similar layout with this one. Here we have a closer look at the Marvell 88SS9189 controller. 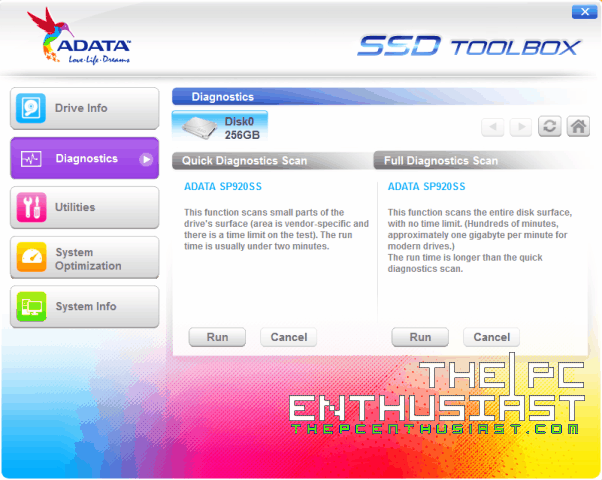 As an added value to the product, you can download ADATA’s SSD Toolbox. The Toolbox provides information such as information about the SSD, Diagnostics, Security Erase, System optimization and system information. 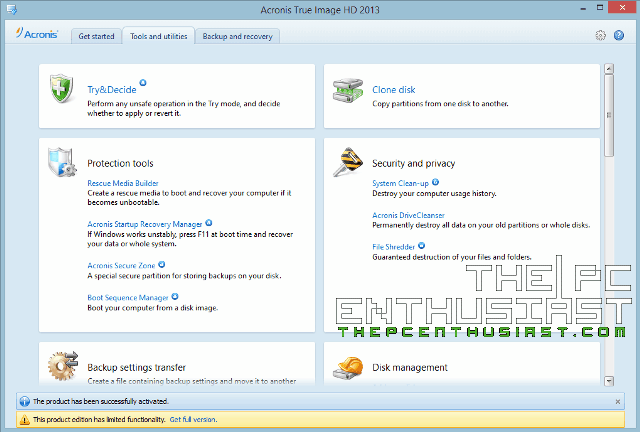 ADATA also included a free Acronis True Image utility. 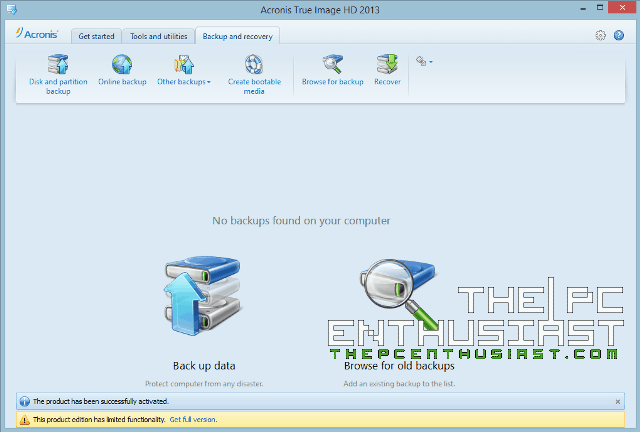 With Acronis True Image HD 2013 you can backup your drive, recover data, backup your data to the Cloud, Clone a disk, and migrate a drive and more. In testing the ADATA SP920SS 256GB, I installed it on an Asus Maximus VI Impact Z87 motherboard, powered by an Intel Core i7-4770K processor. The firmware version is MU01. The SP920SS 256GB was plugged in a SATA 6Gbps port using AHCI (Advance Host Controller Interface). The SSD was also not populated with any files, meaning it has a 100% free capacity. Below are the specifications of the test unit. Please note that results may vary depending on the system and PC components used, as well as the benchmarking tools. You may not get the same results compared to my test, or better yet, you might get higher results if you have a better system. Below is the benchmark result of the SP920SS 256GB using ATTO Disk benchmark. The maximum read speed I got is around 563MB/s and max write speed is around 355MB/s. These results are near to the drive’s rated speed. The next test is using HD Tune Pro version 5.50. During the test the drive was not formatted. I have un-formatted it or deleted the volume since you cannot do the write test if the drive is formatted. You will get an error message saying “Writing is disabled.” As you can see, the results are lower compared to ATTO. I already expected this since I notice that this utility usually returns a lower read/write speed even in my other SSD reviews. I only got a maximum read speed of 422.7MB/s and a maximum write speed of 339.5MB/s. 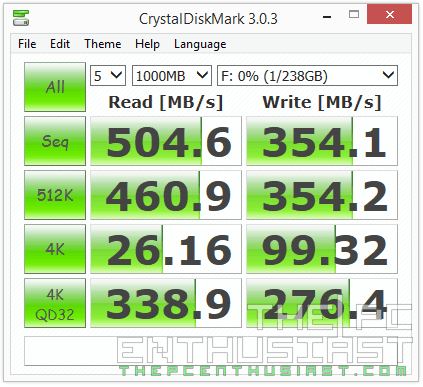 Next is a widely used SSD benchmarking tool, the CrystalDiskMark. 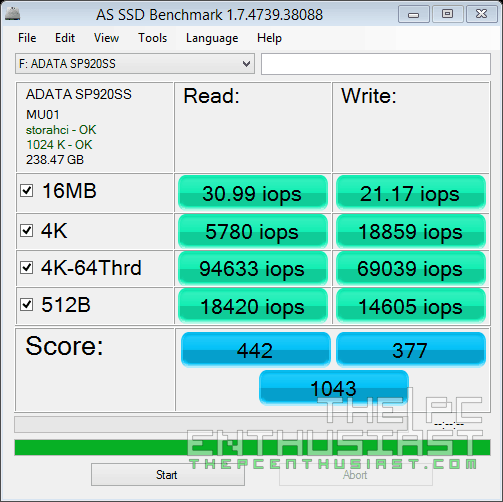 I tested the ADATA SP920SS 256GB in both 32bit and 64bit operations. The read speeds are above 500MB/s and write speeds are near 360MB/s. 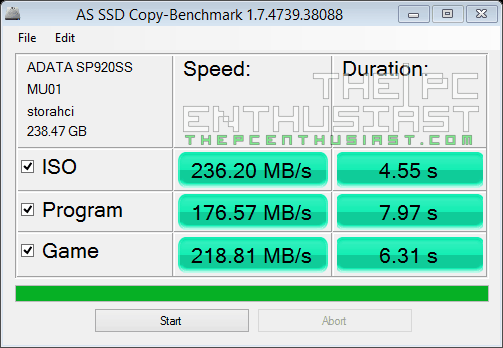 The AS SSD Benchmark tool (version 1.7.4739.38088) is also a popular tool used to benchmark SSDs. The drive seems to be performing consistently throughout the test. Read speed is around 495.77MB/s which is very near to the 500MB/s read speed I got from the other tests, while write speed is around 338.65MB/s. 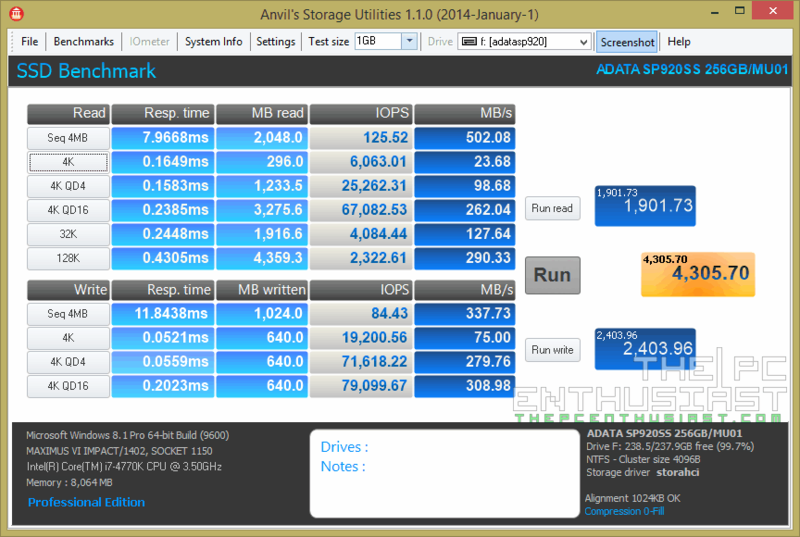 Finally I used Anvil’s Storage Utilities SSD Benchmark to test the ADATA SP920SSD 256GB. 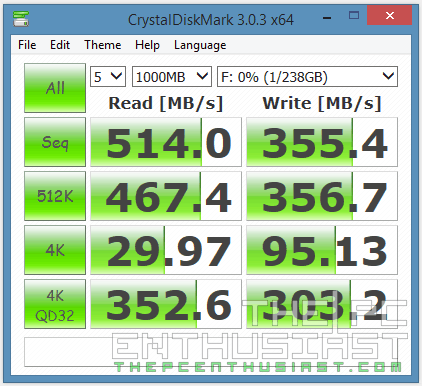 This is a great tool and gives you more benchmark information compared to the CrystalDisk and AS SSD. You can test the SSD in either a 0-fill compression scenario, or 100% compression (incompressible) scenario, or a mixture of both. 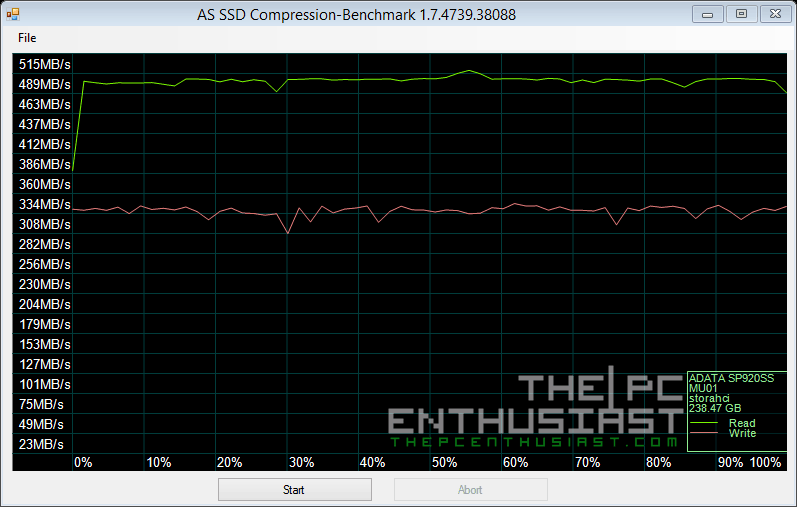 As you can see the SP920SS 256GB performed well on both compressible and incompressible data. Read speeds is around 500MB/s for both test, and same goes with its write speed that remained around almost 340MB/s. What does these benchmark results tells us? 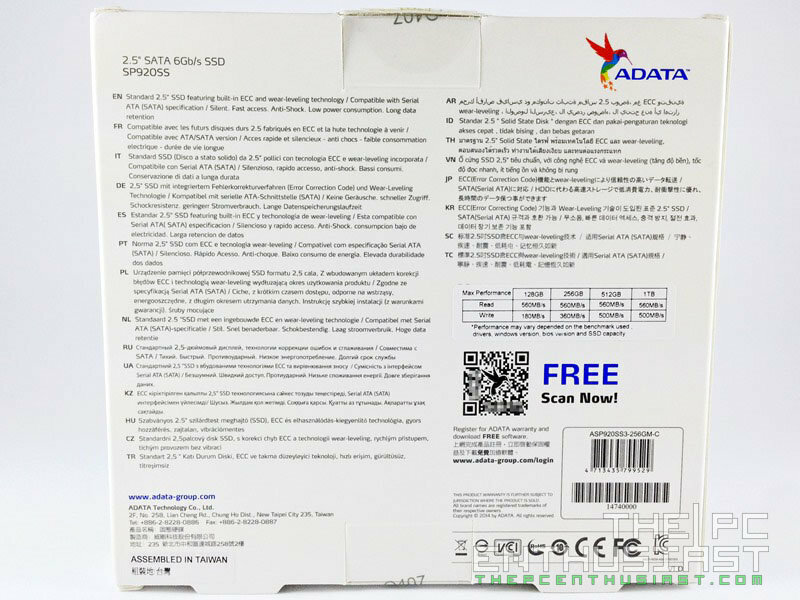 According to its specs sheet, the ADATA SP920SS 256GB has a rated 560MB/s read speed and 360MB/s write speed. I don’t expect that the drive will perform constantly at those speeds since that doesn’t really happen in real world. But I do expect that the SP920 should at least have a read/write speed closer to its rated speed. And based on the results I got during my test, the SP920SS 256GB performed consistently closer to its rated speed, which is actually a good thing. The ADATA Premier Pro SP920 128GB and 256GB capacity are widely available on the market right now. You can get a 128GB for $89.99 $69.99 here, while the 256GB is currently priced at $149.99 $129.99 here. These prices are already cheaper compared to its Crucial M550 counterpart, not to mention the added bracket and free software that ADATA threw in. The M550 128GB is currently priced at $95.37 $86.99 here, while the M550 256GB variant is currently priced at $156.99 $139.99 here. Meanwhile, the ADATA SP920 512GB and 1TB is expected to have a manufacturer’s suggested retail price of $334.99and $529.99 respectively. But I don’t see that it’s listed yet on my favorite online stores. Based on my tests, the ADATA Premier Pro SP920SS 256GB actually performed well. It’s constantly performing at around 500MB/s read speed and around 340MB/s write speed which are close to its rated speeds. Not bad actually for a rebranded M550. I don’t have an M550 to compare it with, so I can’t comment on how it performs on par with its M550 counterpart. However, based on the specs sheet of the SP920, it seems that the 128GB suffers from lower write speed compared to its counterpart. My use of the SP920SS 256GB didn’t actually ended on the test bench. I did not to limit the use of the SP920SS to a desktop computer alone. 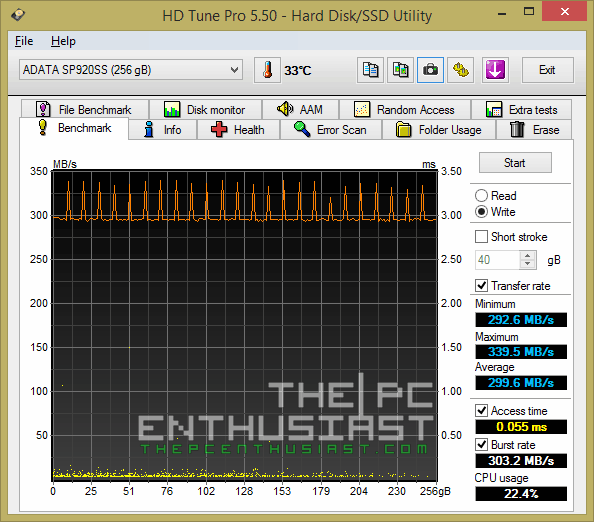 I decided to upgrade my laptop’s hard drive (Asus Vivobook S550), replacing its 5400RPM HDD with this SSD. I did not use the migration utility since the Vivobook’s drive is 750GB, and the SP920 is only 256GB. There are hidden partitions which contained the recovery and OS installer. So I decided to do a clean install instead. The OS installation was fast. I installed all the software and copied some of the files back. I was very happy since the laptop is now running faster than before. Well, not in terms of compute performance, but it was faster in a sense that it became more responsive, booting and shutting down was significantly faster, opening applications and doing multitasking was noticeably faster as well. Overall, it’s a great upgrade for laptop users as well. Now back to the main topic, aside from the 3.5mm bracket and Acronis True Image HD 2013 software that ADATA included, it also comes with a competitive price. It’s cheaper than its M550 counterpart, but I would want to see that ADATA lowers its 128GB and 256GB price further to compete with other brands, specially Samsung. I’m not really a fan of software bundles, but that’s just me. 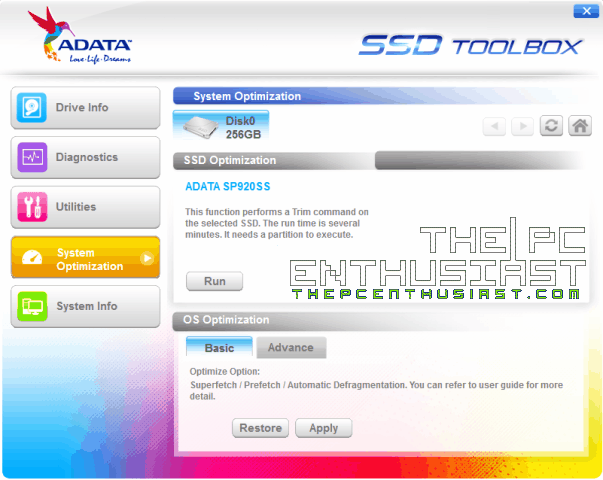 If you need an SSD that comes with a free migration software then you might want to consider the ADATA SP920 series. Aside from the included bracket, 2.5mm adapter and the Acronis True Image Utility, ADATA is also giving a full 3 year warranty. I can recommend the SP920SS 256GB, but not the 128GB capacity due to its mediocre write speed. But where the ADATA SP920 performs at its best is with the 512GB and 1TB capacities. At the end of the day, I find this product deserves The PC Enthusiast’s Highly Recommended Award for its competitive price and the included bundles.